Instructions: We are looking at a grid of 9×9 boxes. The boxes symbolize buildings with heights ranging from 1 to 9. The objective is to fill in the correct height of each building, considering that each height appears just once in each row and each column. The small digits in the upper left corners of the boxes reflect the amount of buildings the respective building can oversee in its row and column. Try out here at Logic Masters Germany. 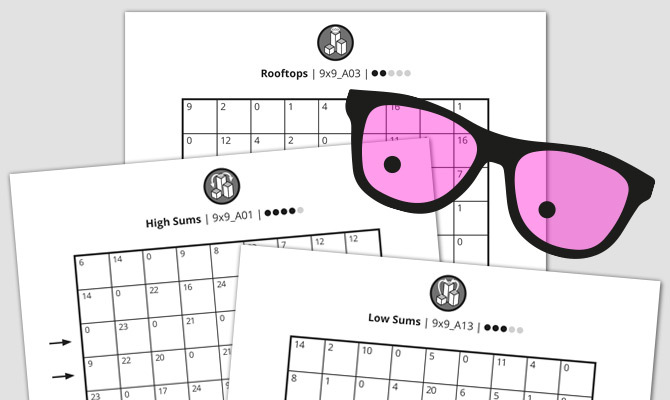 Read about „Rooftops“ in Puzzlewiki. Instructions: We are looking at a grid of 9×9 boxes. The objective is to fill the grid with digits so that each column and each row contains all of the digits from 1 to 9. The preprinted number in each box reflects the sum of the orthogonally adjacent smaller digits. Casually speaking: the smaller digits feed the preprints of the neighbouring larger digits. Read about „Low Sums“ in Puzzlewiki. Instructions: We are looking at a grid of 9×9 boxes. The objective is to fill the grid with digits so that each column and each row contains all of the digits from 1 to 9. The preprinted number in each box reflects the sum of the orthogonally adjacent larger digits. Casually speaking: the larger digits feed the preprints of the neighbouring smaller digits. Read about „High Sums“ in Puzzlewiki. © 2017-2018 TPPD / Thade Precht Playful Design. All three puzzle types can be test-played in the puzzle portal of Logic Masters Germany.